The Bedford Flag is probably the oldest existing flag in the United States. It dates to the early 1700s and was probably used in the French and Indian War. Legend has it that this flag was carried into the Battle of Concord at the beginning of the Revolutionary War on April 19, 1775, by Nathaniel Page, cornet of the Bedford, Massachusetts Minutemen. The flag remained in the Page family for many years and now resides in the Bedford Free Public Library in its own climate controlled case for preservation. Read more about this flag's fascinating history below. The Bedford Flag is a red piece of silk damask approximately 27" by 29". It's square shape indicates it was a cavalry flag. Along the sides, a pattern of pomegranates, grapes and leaves is sewn into the cloth. The rest of the design is painted on with silver and gold. 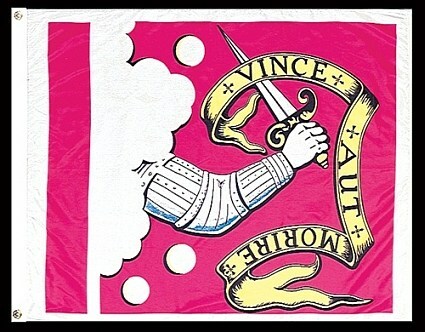 A mail covered arm sticks out of a cloud holding a sword, while a banner with the Latin words "Vince aut Morire" (Conquer or Die) furls down the other side. Three cannon balls float in the air by the arm. On the reverse side, the design appears again with a few differences. The sword is in front of the banner, instead of behind it, the sword is held in the left hand, instead of the right and the motto reads from bottom to top, instead of top to bottom. A narrow fold would have been stitched and attached along the side for the pole to slide into. Some of the needle holes are still faintly visible on the original Bedford Flag, which is housed in the Bedford Free Public Library. The daughter of Cyrus Page removed the silver fringe from the edges of the flag to make a dress with early in the 1800s. When the flag was being restored by the Textile Conservation Center in Lowell, Massachusetts in 1999-2000, they found a single remaining microscopic strand of the silver thread. They also found evidence that a tassel probably hung from the hoist side of the flag. During the restoration, it was discovered that the silver paint was made from actual silver and the gold paint from actual gold. 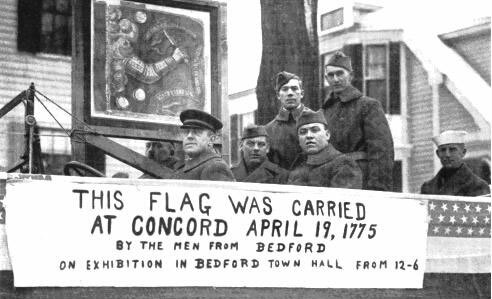 The Bedford Flag was allegedly carried into the first battle of the American Revolution at Concord on April 19, 1775 by minuteman Nathaniel Page of Bedford, Massachusetts. Page was the Bedford Minutemen's elected cornet. The cornet in colonial militia carried the flag for the unit. This was an important position because the cornet would signal the captain's directions to the rest of the unit who might not be able to hear his commands during the heat of a battle. The cornet would stand next to the captain at all times so he could accurately convey the captain's messages to the troops. Because of the importance of the cornet's role, he was often targeted in battle and many cornets were shot down from underneath their flags. Early on the morning of April 19, 1775, before the first shots were fired at Lexington, Lexington Captain John Parker sent out couriers to towns around the area to call their minutemen to arms. Benjamin Todd and Nathaniel Monroe went into Bedford as couriers. They knocked on the door of Nathaniel Page early that morning shouting, "Up, Mr. Page, the regulars are out!" 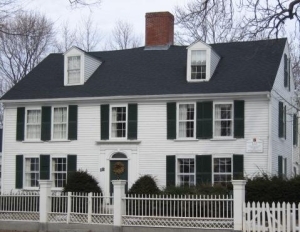 Nathaniel Page and the other 25 members of the Bedford Minutemen gathered at Fitch Tavern, a tavern still located in the center of the town, that was owned by Bedford Militia Sergeant Jeremiah Fitch. 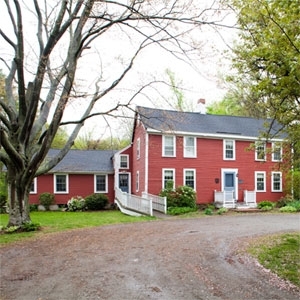 The Minutemen gathered around the fireplace in the tap room and Lydia Fitch served them cold cornmeal mush and hot buttered rum. Captain Jonathan Wilson rallied the men, telling them, "It is a cold breakfast, boys, but we'll give the British a hot dinner; we'll have every dog of them before night." The men then marched toward Concord, joining with 50 others on their way. According to Cyrus Page, Nathaniel's grandson, who is also the primary source for the legend, when the Bedford Minutemen arrived in Concord they assisted others in removing the remaining military supplies from their storage place to greater safety. Nathaniel said he laid the flag down to help in moving the supplies. When he had finished, he came back to get the flag and found that some boys had picked it up and were "playing soldier." Page then took the flag and the company marched to the Olde North Bridge to engage the British Regulars. The Bedford Minutemen suffered no casualties in the first engagement with the British at the Olde North Bridge. After this engagement, they accompanied the other numerous Minutemen companies in harassing the British all the way back to Boston. The Bedford Minutemen suffered their first losses while engaging the British at Merriam's Corner a mile from Concord. Job Lane, a descendant of early settlers in the area, was severely wounded and Captain Jonathan Wilson was killed. The Bedford company joined the other Minutemen as they moved toward Boston, ending up at Cambridge, where they stayed for seven days. Nathaniel Page then returned home to Bedford with the flag where it stayed for a hundred years. Historians debate the Bedford Flag story, primarily because it was a family tradition that came to us from Cyrus Page, the grandson of Nathaniel Page, who said Nathaniel Page told him the story. 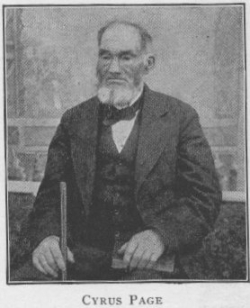 Cyrus told the story to nineteenth century historian, Abram English Brown who then wrote it down. There is no other account to verify the story, even though there were voluminous depositions of soldiers and observers given on both sides. In their efforts to record the events of the day, both British authorities and the Massachusetts Provincial Congress collected depositions from everyone involved that they could. Others wrote of the day's events in diaries or personal letters. In all of these accounts there is only one mention of a flag anywhere that day. British Officer, Lieutenant Barker reported that he observed a flag flying from a liberty pole on a hill near Concord and that he saw some British grenadiers chop the pole down. He did not say what the flag looked like, however. Barker also reported that this happened several hours before the Bedford Minutemen arrived at Concord and far to the west of the hill. This is the only contemporary account mentioning any flag at the Battles of Lexington or Concord. Some historians discount the story because of the lack of corroborating accounts. There are, however, some facts that at least indicate that the story might be true. The questions of who made the flag and when are not known, but the flag itself gives us an approximate time period. The floral pattern on the cloth has been dated by historians to the early 1700s. Cyrus Page claimed the Bedford Flag had been in his family for generations. Indeed, the Bedford and Billerica town records indicate that Nathaniel's grandfather, father and uncle all served in the position as Bedford militia's cornet. A Page had been carrying the flag since 1720. The actual commission naming Nathaniel's father John "Cornett of the Troop of horse," dated 1737, is on display at the Bedford Free Public Library. It was the custom of colonial militia units to have the colonel or new captain of a unit to design and procure the flag. So Nathaniel's ancestors would not have created the flag, but this would have been done by a higher officer in the unit. For many years historians thought this flag might actually be another Massachusetts cavalry flag for which we have a drawing made sometime around 1660. The Three County Troop Flag, representing Essex, Suffolk, and Middlesex Counties, was commissioned along with a drawing some time around 1660. 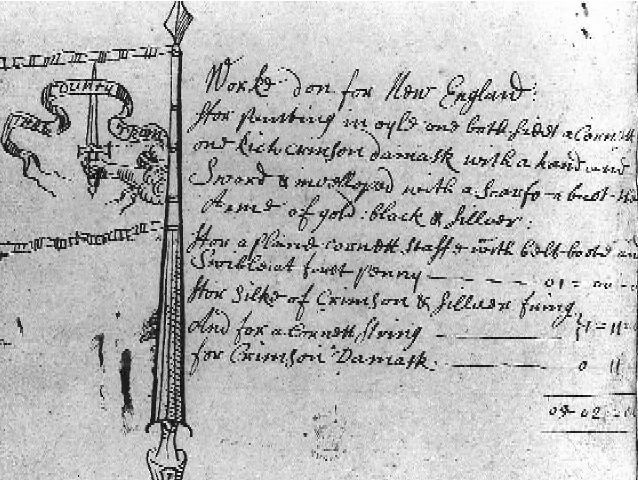 In the drawing is an arm holding a sword that is very similar to the one in the Bedford Flag. Cyrus Page believed his grandfather's flag was indeed the Three County Troop Flag until he died. Historians agreed for many years, in spite of the fact that arms holding a sword in this fashion was a very common symbol on European flags of the 16th and 17th centuries. This theory of the Bedford Flag's origin was put to rest in 1999-2000 when the Bedford Flag was being restored by the Textile Conservation Center in Lowell, Massachusetts. Spectroscopic analysis of the paint on the flag revealed a pigment known as "Prussian Blue." Since Prussian Blue was not created until 1704, the flag could not have been created earlier than that. A final piece of evidence is that Nathaniel Page is listed on the official military rolls of men who were paid for serving in the militia on April 19, 1775. Each of these facts put the Bedford Flag in the Page family and makes the flag of the right historical age to fit neatly with Cyrus Page's story. Without further evidence, however, the story can not be said to be a certainty. Nathaniel Page's youngest daughter, Ruhamah told AE Brown that when she was a young girl she cut off the silver fringe from the flag. She told Brown, "I took that silver fringe from that old flag when I was a giddy girl, and trimmed a dress for a military ball. I was never more sorry for anything than that which resulted in the loss of the fringe." Read the complete Concord Hymn by Ralph Waldo Emerson here. This poem is the source of the famous phrase "The shot heard round the world," which is often used when referring to the beginning of the American Revolution. Many people believe the flag Emerson was referring to was the Bedford Flag. However, there is no evidence in Emerson's own notes or writings that he was referring to this flag or that he was even aware of its existence. Cyrus Page is known to have sent the flag to the centennial celebration of the outbreak of the Revolutionary War at Concord on April 19, 1875 where it was carried by a delegation from Bedford. He also flew it from the Page Homestead in 1875 at the sesquicentennial celebration of Bedford. On October 19, 1885, the 104th anniversary of Cornwall's surrender, and shortly before his death, Cyrus gave the Bedford Flag to the Bedford Free Public Library and asked them to keep it as a "relic of by-gone days" to be "kept for the inspection of the public at all proper times." Today you can visit the Bedford Free Public Library and see the original Bedford Flag in its climate controlled vault. All you have to do is give your driver's license to the librarian and she will give you a key to the small room where it is stored! Sharon McDonald is a long time librarian at the Bedford Free Public Library. She is also an expert on the Bedford Flag. Watch this very interesting video of Sharon telling its history. The Bedford Flag from Bedford TV on Vimeo. Sharon also wrote a fascinating book called The Bedford Flag Unfurled, which is an in depth study on the origins of this interesting piece of Americana. Order your own Bedford Flag here and help support this website.